Product prices and availability are accurate as of 2019-03-18 19:52:55 EDT and are subject to change. Any price and availability information displayed on http://www.amazon.com/ at the time of purchase will apply to the purchase of this product. This flat rubber washer is made of rubber material, round shape, easy to install. Heat resistant,oil resistant Sealing Ring. Widely used in bathroom product, valve, faucet, bearing, hydraumatic, pump, home appliance, toy, electric motor, etc. 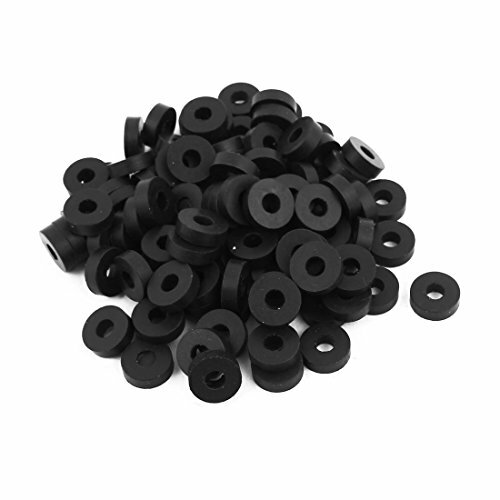 Country of Manufacture: CHINA; Material: Rubber Net Weight: 65g; Package Content: 100(+/-2%)pcs x Rubber Flat Washer Main Color: Black; Product Name: Flat Washer Outer Dia: 13mm / 0.51"; Thickness: 4mm / 0.16" Inner Diameter: 5mm / 0.2"